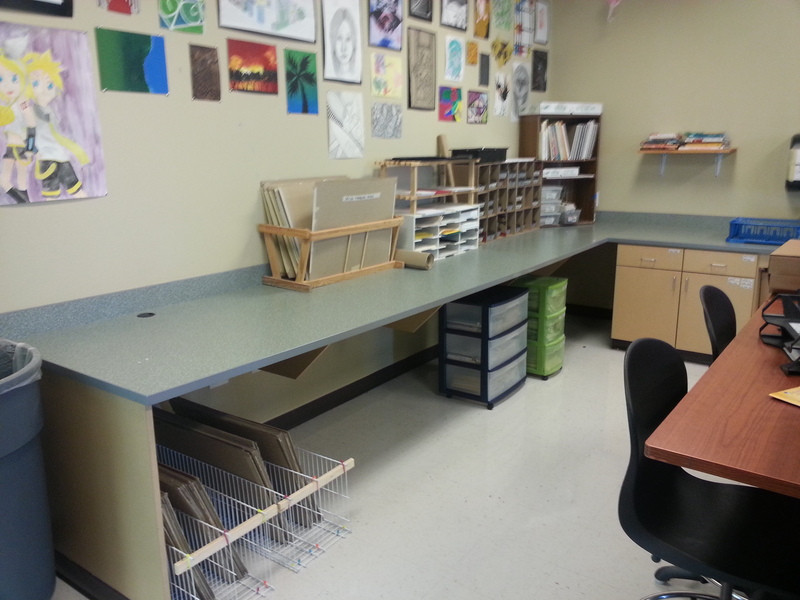 From time to time, I come across the question of how to run a class that has a single focus such as painting, printmaking, or ceramics following a TAB pedagogy. It seems as if people think it isn’t possible to be fully TAB because the students don’t have 100% choice of everything. I mean, the medium is already chosen for them. Well, I think it is possible, and I have been running my ceramic classes that way for the past couple of years. It has evolved into the almost fully student-led class it is today, but there is always room for improvement. As we know, TAB isn’t just about giving the students free reign over things. It’s about a way of thinking and about the process of going from conception through to end product and all the steps in between. So, since it isn’t about a product so to speak, that leaves room for lots of exploration, skill building, and concept growth. 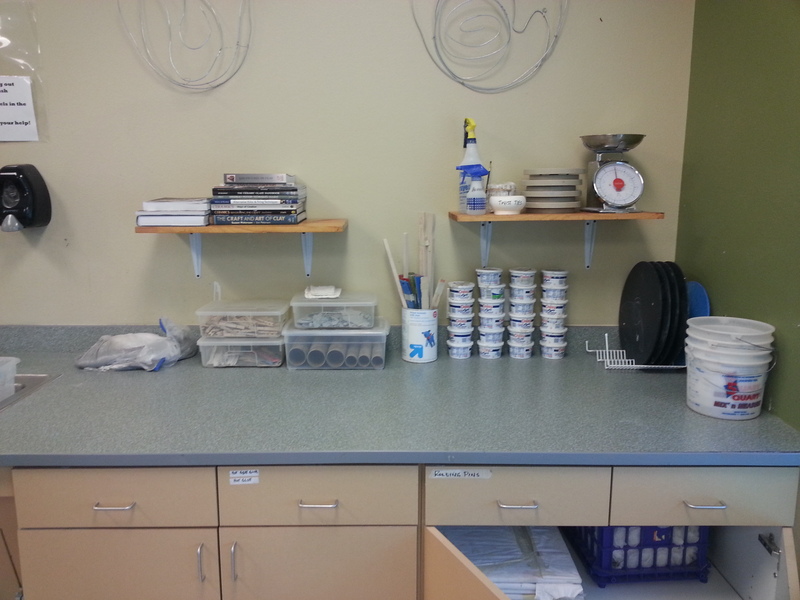 I have three levels of ceramics…beginning, intermediate, and advanced. My program is small, so intermediate and advanced meet at the same time. I think that is better anyway. Our classes run for a full year. I start off my beginners with a bunch of “have to” projects. Yes, I know, not very TAB, but I think this lays the ground work for moving to full student driven work. We spend the first semester learning basic hand-building techniques: a slab box with rolled in texture, a carved pinchpot sphere, a carved tile, and a coil built vessel with some kind of additive texture. We also spend some time on the wheel. The students do have some choice aesthetically, but in the end, I have picked the project for them and I know the outcome. Once we get passed that, we move to themes. I came up with a bunch of themes and put them on the class’ website. Under each theme, I asked some questions to help them begin thinking about how they could interpret the theme. 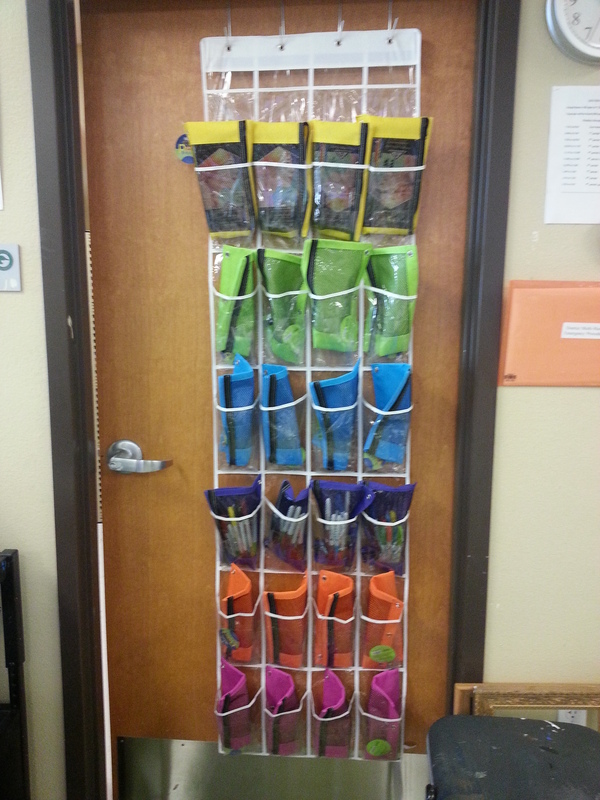 From there, they can pick a theme that speaks to them and begin the creative process. They decide how to build. They decide size. They decide clay type (we have low-fire, mid-fire for the wheel, and porcelain). They also decide their time schedule. They work at their pace. No longer is the class all together in the same place working on the same thing. My intermediate and advanced classes work in the same way, but without the have-to projects at the beginning of the year. We do start together with the same theme–just to get back into the flow and shake off the summer, but after that, they can move into their own groove. If a student wants to repeat a theme, they can. If a students doesn’t like any of the themes, they can come up with their own. Once pieces are bisqued, they also get to choose surface treatments. Not all students like to glaze, so I have tried to show and display many other non-glaze treatments. This really gives a lot of variety to the pieces my students create. Another great thing about keeping the class student-led is that it really allows for mistakes and taking risks. Students don’t have the looming deadline over them of a piece they may not even want to be doing. If a piece blows up in the kiln because I rushed it or it falls apart because they didn’t score/slip properly, the kids have been okay with that. They move on to the next thing and figure out what went wrong so they don’t do it again. If something they are building isn’t coming out right, they are more willing to fix it or take it apart and try again because they know their project isn’t being graded and that I am instead looking at their artistic process, habits, and growth. As for assessment, I do follow the same thing I do for all of my classes. Each student has a blog and has to write about artistic behaviors every other week to let me know what they are doing and how they are progressing and thinking like artists. However, for the past 6 or so weeks, we have been playing with a combination blendspace and the blog. 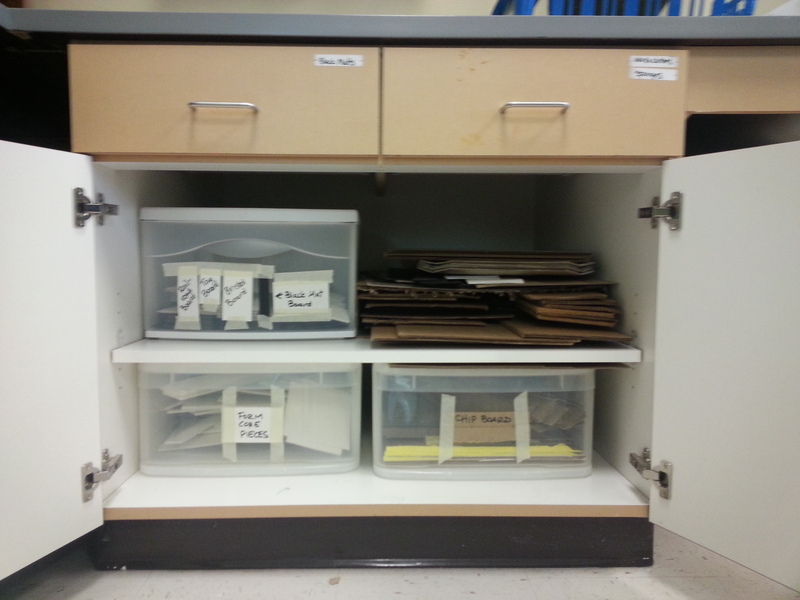 As my class evolves, I am working on changing up the ceramic reader I have created to be more helpful to the students. I am also going to implement what I plan on calling “Technique Tuesday”. I have created a list of things I think the students should know how to do and what they are, such as press molds, sprigs, 2 part molds, different tools, glazing techniques, etc. I really enjoy running my ceramic classes under the TAB pedagogy. My students have really began to flourish. I can see them applying the techniques they have learned. They are creating pieces that are important to them. It allows them to be always working and not waiting on classmates to finish in order to move on. It allows them to stop a project for a while and come back to it later. One of my intermediate students, Julia, is working on a willow tree. She has been all year. But, she also has worked on other pieces when she tires of it. She comes back to it with more interest each time. It is a fabulous piece. Another student, Frank, has been able to work in a more “make it up as I go” type fashion…which is where his work flourishes and becomes fabulous. Having “projects” wouldn’t work for him. A beginning student, Braeden, has completely blown me away this year because the TAB atmosphere has allowed him to follow his path. He has learned how to make his own clay, how to create his own wood ash glaze, and he is close to surpassing me on the wheel. If I made him to projects, he wouldn’t have realized that working in ceramics is what he wants to do with his life after high school. I am writing about my experience, but I think this can be done in any single-medium class. It’s all about giving them the reins to drive what interests them. They will learn the process as they go along. It’s about learning through exploration. Because it is single-media, they really get to know the ins and outs; therefore, since so much time isn’t spent learning multiple mediums, they can really focus more on message, process, and content. Which, in my opinion, leads to higher quality work. I know it has been over a month and a half since I last wrote, but it’s kind of been the same old, same old in my classroom. But, as the new year and the new semester began, I have many new ideas and things I am trying out with my students. And, I am going to start with a new to me way of exploring. I did an activity similar to what fellow TAB teacher Cynthia Gaub does called Around the Room. I changed it to Exploration around the room: collage and mixed media. Art 1 jumped right back in when returning from our winter break. They had new media and techniques to explore and I wanted them to have a new way to explore them. So, I lined the counters with some large sheets of paper and place a ton of items out for them to explore with: plexi, excess pieces of laminate, and plastic bags for monoprints, cardboard and styrofoam for printmaking, bubble wrap, flowers, feathers, spools, and a plethora of other items for stamping. I gave a brief introduction outlining part 1 of our exploration activity and then let them go on their way to create some new textures and backgrounds. At first some were hesitant, but by day 2, they were comfortable and trying new ways of printing with the different methods and objects. Once we were done exploring stamping and printmaking, we learned about collage and mixed media. Students were then challenged to take what they had made during their exploration and to use them in someway…either as the ground for a new artwork to be placed on top or as paper to be cut up and used in a collage. Once the students finished with their exploration artwork, the students reflected on what they learned through a technique exploration blog post. ​Here are some of the fabulous practice works the students created. I have a few tweaks to make, but I like this way of exploration. I want to combine it with the other methods I use. Not sure how I am going to do that yet, but it will come to me. It’s art show season for me, and probably for many of you. 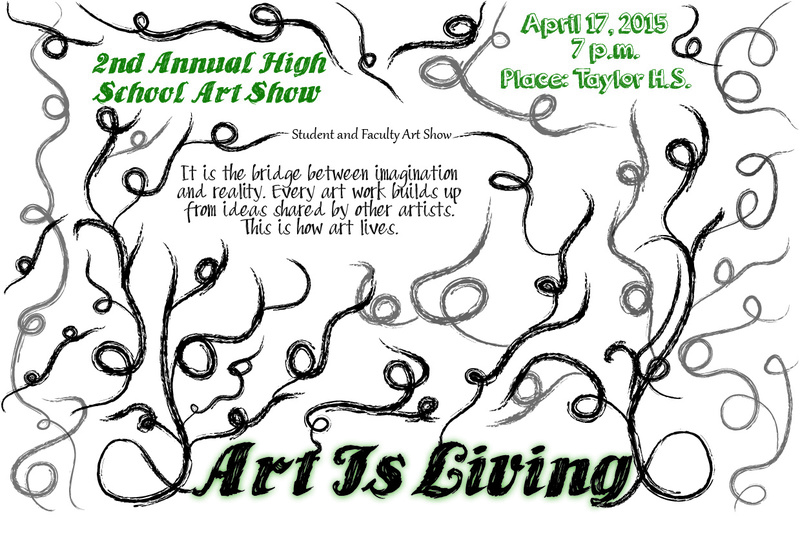 This is my second year heading up our annual art show. And, it is the second year my school had an annual art show. So, um, yeah. I thought I would share some things that I do to make my show a success. I start collecting works at the start of the year. I know some teachers prefer to have the students curate the show. That’s not my style. It is a matter of choice. My co-worker this year had students submit what they wanted. I am curious to see how that goes. In any case, I find that starting at the beginning of the year helps when it comes time for mounting. You can start mounting whenever you want. No need to wait until the week before or the week of. I print out rosters for all of my classes with a blank grid. As I collect artworks, I check off a box for that student. This helps me make sure I have something from almost every one and it helps when it is time to make labels. I mount all my work on black construction paper. There are a few examples that need white mats, but for the most part, black is good. I don’t have a lot of extra money or time for fancy mats. The works look good on the black construction. And, it is easy to do. I don’t mat works that are on canvas board. Those get hung as is. I make all the mats have a 1″ border. I created a tool to help with mounting. It is a 1″ wide “L” I cut from chip board. I can line it up with one corner of the black mat, spray the back of the artwork, and then use it to guide the artwork on to the mat. It really has helped to cut down on the time it takes to mount over 200 pieces of artwork. This year I had my aide help me out with labels. Last year I bought a large pack of Avery return labels. The labels fit perfectly on the 1″ border of the mat. I only put the student’s name on the label. My aide downloaded the template and uses the list I have created on my rosters so she knows how many labels to make each student. For 3-D artwork or non-matted work, I put the name labels on 3″X1.5″ bristol board tags. These get either placed by the sculpture or tacked on the wall just under the artwork. If you have ever told a high school student to tell his or her parent something, you know most likely whatever it is will never get relayed to them. So, I thought a great idea was to send invites to all the parents/guardians of the students who have artwork in the show. Here is my template. (Please note, the original was made in pages and that does not upload to google docs so well. The font on the original is a script, which makes it look a bit more fancy.) I put 4 invites on a page and print onto white cardstock. I found some envelopes at Michael’s that fit the invites perfectly. The counselor’s secretary was super nice and printed out all the “to the parents of” labels for me to make addressing them easier. I also send invites to the superintendent, the deputy superintendent, the head of HR, all my principals, the middle school art teacher, and the teachers and staff at the school. Their invites are the same, but I leave out the part about their young artist having work in the show. I think it is nice to formally invite my colleagues and administration. For other advertising, we do a couple of other things. A student created a poster this year to hang all over the school. A huge banner is being created to hang from our school’s balcony. The poster is being run in the announcement powerpoint at lunches. We shared the poster with our district PR person. He came and took pictures of the students getting things ready. He will run these pics on the district FB group. I think it will also go in the local paper. We have the poster running on the front page of the district and the high school websites. My principal set up an all-call to remind everyone about the show the night before. Every art show I have been to has some sort of food at the opening. This show should be no different. I have talked with the culinary teacher, and her students are going to create some yummy treats for the event. This adds a little something extra to the show. This year we we also be adding some music. I have talked to the band director and he agreed to have some students play some nice music during the show. He will set up on the balcony overlooking the show. We are having the show on a Friday evening, so I had to take when to set up into consideration. I am taking the day off for school related business. I have also hand-picked several students to help me hang all the work during the day. I contacted all their teachers and asked them if they could miss their class that day. I found last year it was kind of a pain to have new students each period helping out. I felt like a broken record and things were getting forgotten and nothing was smooth. I thought having the same group of responsible students all day would make things easier. We will hang all the work using poster tack. It works well on both our fabricated wall tiles and our cinderblocks. 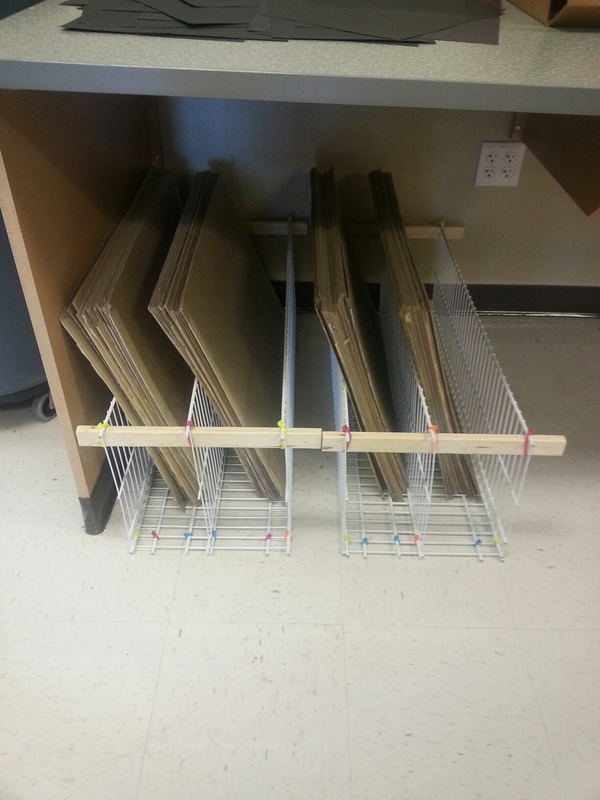 We have a few easels for larger paintings, and we have a place to hang framed work. I saw another teacher this year get the little wads of tack prepared in the days before. I haven’t done this before, but it seems like a great idea. I will ask my aides if they want to do that. 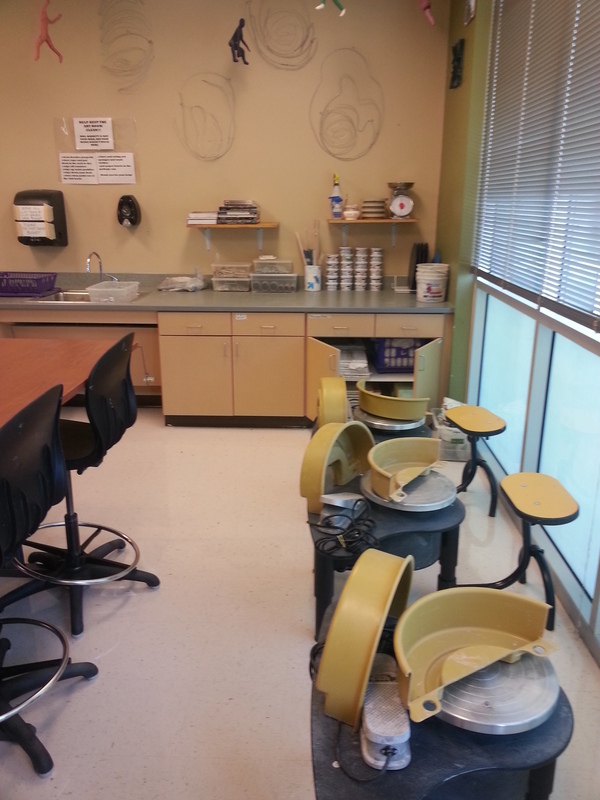 All the sculpture work goes on round bar height tables we have at the high school. Last year I had an abundance of brown burlap, so I cut it to use as table cloths. (I was smart and bagged them up and hid them in the faculty work room for future use.) We will use those again. A cool thing I like to do, which unfortunately I didn’t get to this year–yet, is create QR codes for seniors. It is nice to have a little bit of info about our senior artists near their work. Students give brief responses to questions like what is your favorite media, why do you like art, and what are your plans after graduation. The last thing I like to do is go in over the weekend after the show and take a high-res picture of each artwork. I then edit them, put them in a slide show, and put the show on youtube and my art website. This way, those that couldn’t make the show can still view it. It’s a long slide show, but it helps to advocate for your program. I know this seems like a lot, but if you start early enough, it is pretty easy. Organization is the key, in my opinion. 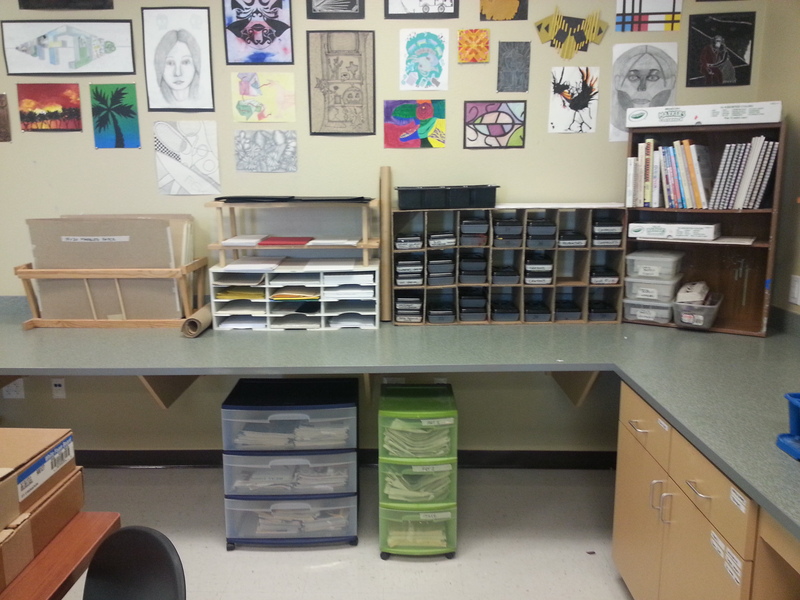 I am a pretty organized art teacher, and it really comes in helpful for events like this. As I said in the beginning, this is what I do. I am sharing in case you needed some help on ways to make your show set-up easier. Use what will help you. Ignore what won’t. Relax. Take a deep breath. And happy Art Showing!!! 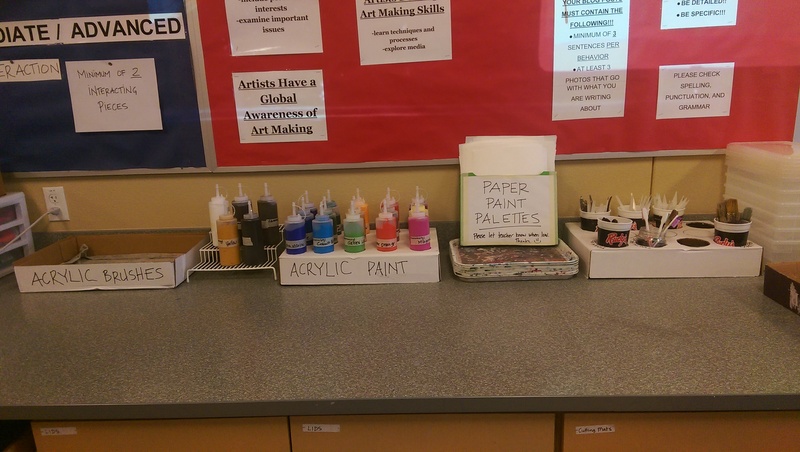 One of my biggest fears/concerns this year when moving to a TAB/Choice-Based classroom was the addition of paint into the mix. Paint is always a scary thing. Kids don’t always wash brushes out and acrylic dries in them. 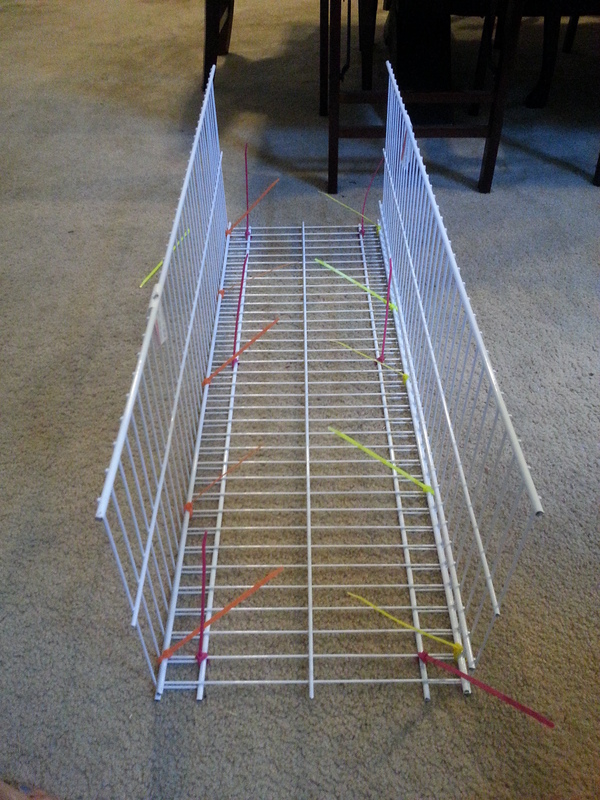 Trays get left behind for me to clean. So much paint gets wasted because no matter how many times you say, “you can always get more”, the kids take enough to cover an elephant. And don’t get me started on those pumps for the half gallon bottles that are always clogged. Since this year I have everything out for the kids to access, I thought paint, both acrylic and watercolor, should be out too. And, not to toot my own horn too much, since I had put so much thought into organization (and it is working very well), that the paint should get the same consideration. I bought a bunch of clear, empty ketchup bottles for my acrylic to try and combat the too much paint/clogged pump issue. I looked through all the stuff I had and found a couple of racks I could use. And, I appropriated several Xerox paper box lids from the work rooms. 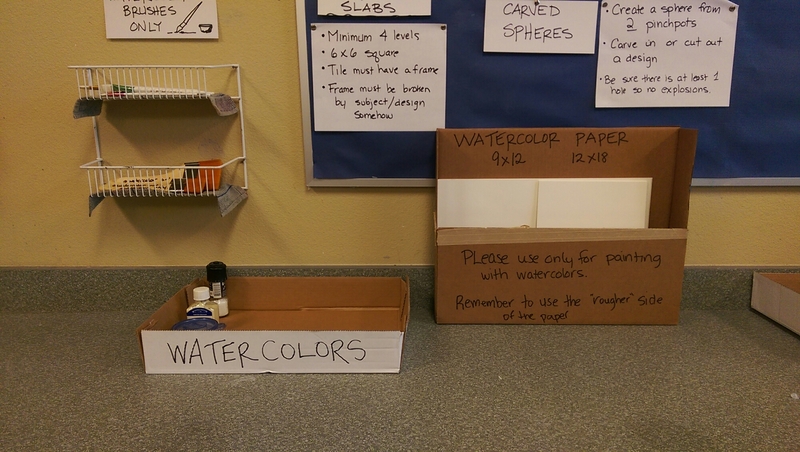 I made 2 areas–one for watercolors, and one for acrylics. So far, so good. 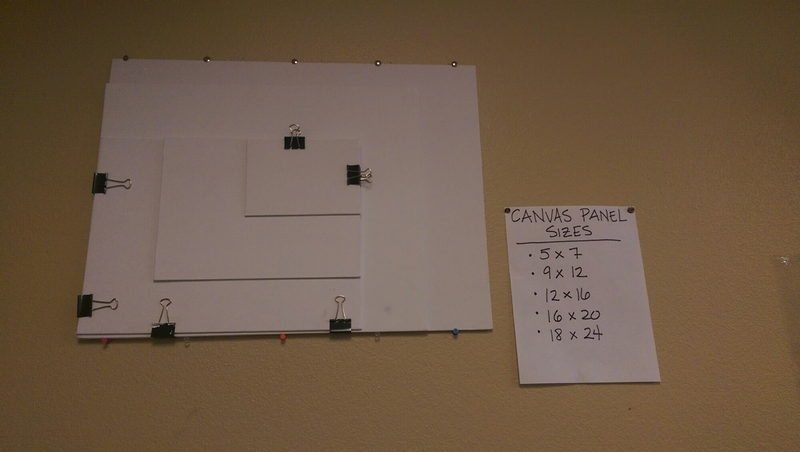 Kids have access to it all, except they do have to ask for the canvas boards. They have been taking only the paint they need. They close the caps on the paint bottles. Almost all brushes are washed well. (They have been following the brush washing video I made for them.) The paper paint palettes help so much with giving them less to clean and more time to work. It seems my fear of introducing paint was unnecessary. Let’s hope they keep up the good work, and good clean-up. Watercolor station. Includes paint trays (not pictured), brushes, paper, salt, resist medium. Acrylic paints in their new bottles. There is a small spice rack stand that holds the neutral colors. 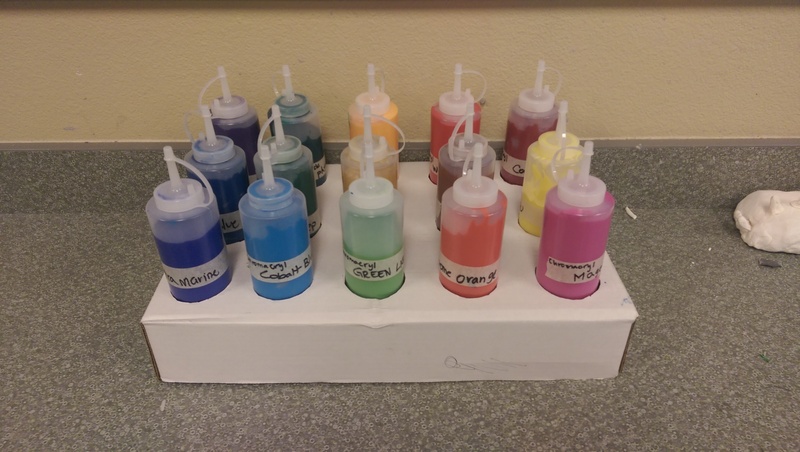 Acrylic paint set-up. 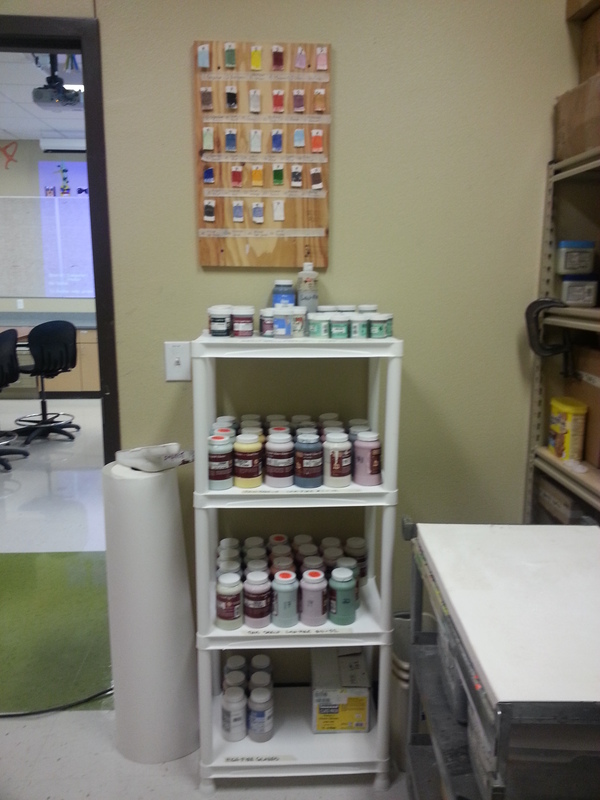 Brushes, other tools, paint trays, paper palettes and brushes. There is a towel in the brushes box top so wet brushes can dry and not destroy the cardboard. Several years ago I made wooden cradles to hold my students’ rather large portfolios. 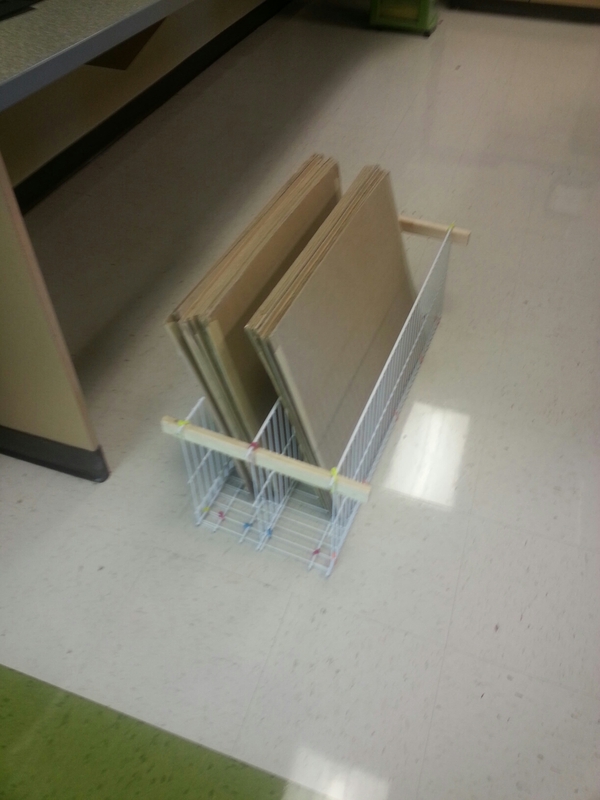 I attended a session at the TAEA conference about building racks and the presenter gave us her plans. Well, they lasted me about 6 years, with some repairs here and there. Had I screwed them together instead of stapling them, they might still be around. Hindsight and all. At the end of last year, I tossed all but one; I had built 7. This year I needed something new. I looked and I looked. 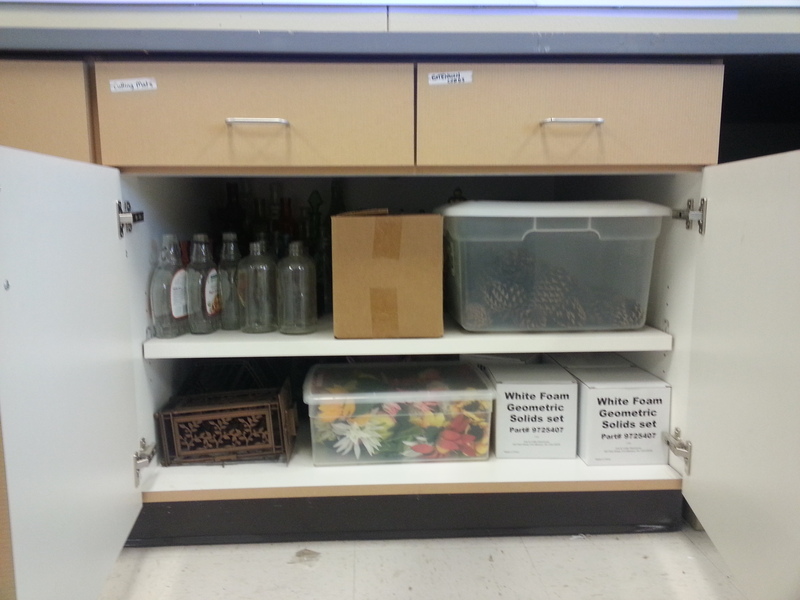 I toyed with plastic drawer units which would require smaller portfolios. That saddened me, but I couldn’t think of much else. I tried to make something out of a window box planter liner and some wooden feet. It sucked. Then it hit me in the car on the way to the aquarium. 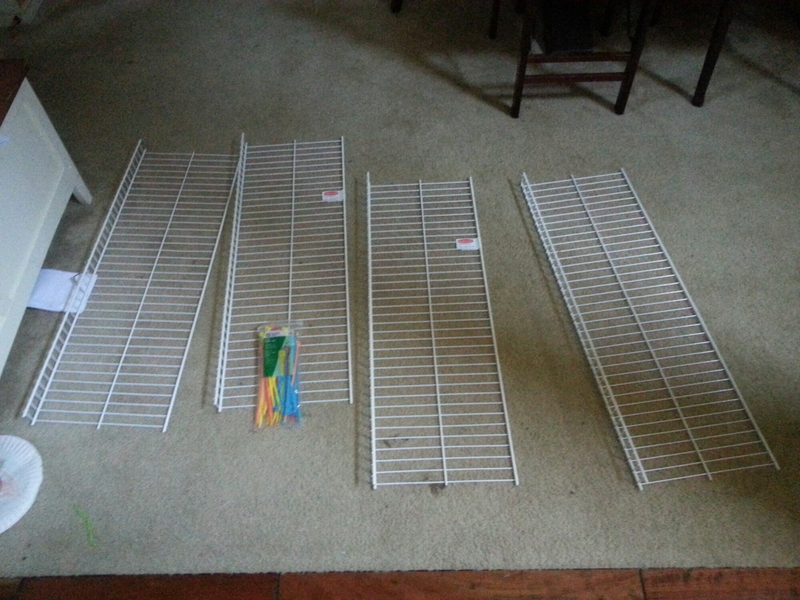 Wire storage racks and zipties. My daughter and I headed to Lowe’s (after looking at the fish at the aquarium of course.) They had 6′ lengths and I needed half that. Luckily they had bolt cutters there for that reason. I ziptied the sides on first. and tied the last piece down the middle. 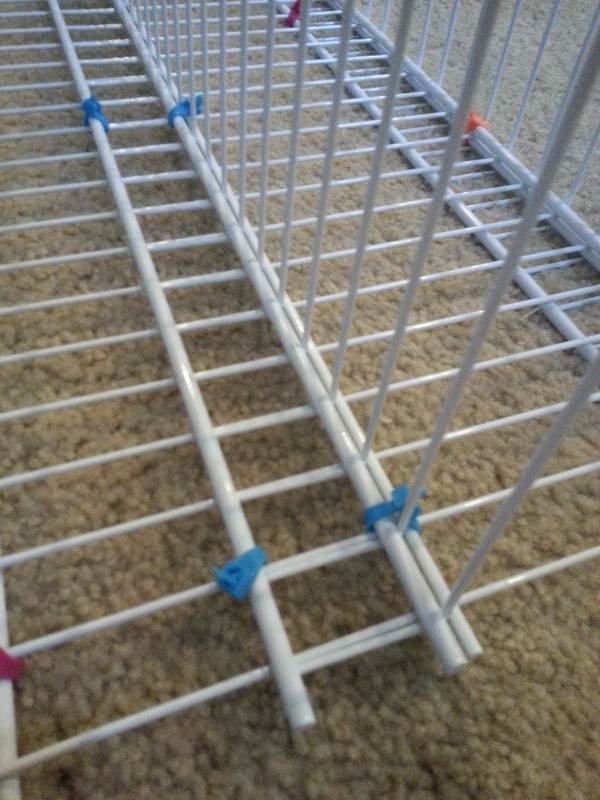 I added the upper supports today when I put in some portfolios to check the strength. As you can see, it will hold portfolios for 2 classes. I have 4 classes that need portfolios. So, I built 2 racks. I just need to cover the sharp tips and they are done. I am quite pleased with my hack. And, it was relatively inexpensive.